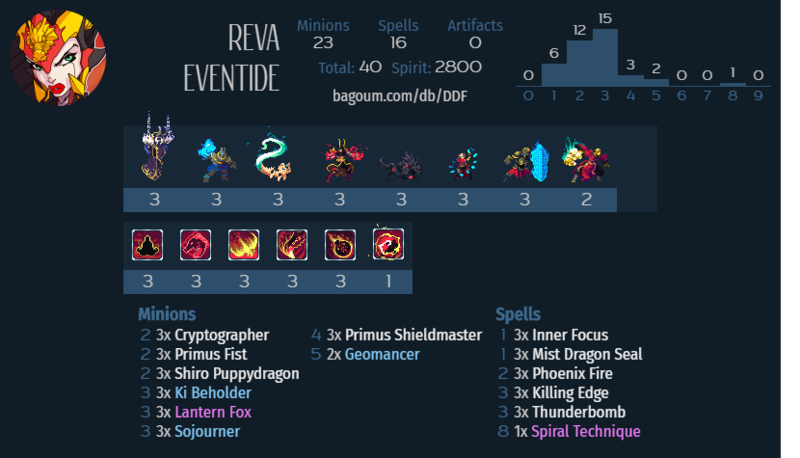 Update from my initial Reva list (https://duelystcentral.com/2018/03/29/s-rank-on-a-budget-march-2018-reva-zero-to-hero/) with an upped budget to be able to include some good stuff like a full set of Lantern Foxes and a Spiral Technique to finish with. Hey, cool deck, but are there any cards (legendaries and epics i suppose) that i could use to improve the deck? And if so, could you give me some suggestions? Honestly though switching to Aggro Reva may be the best route currently, you can go on duelystcentral top 50 or power rankings to find good lists for that. Alternatively, you could consider switching to Eight Gates if that is your kind of thing (i see frueds list in the ‘similar’ below), actually for changing this list specifically perhaps even Crescent Spear would be the better choice, not sure. However you choose though I wish you Good luck.